"Zwinky” toolbar is a browser hijacker application because, upon installed on your computer, it modifies your default web browser settings to “ask.com” search settings (dts.search.ask.com/sr) and changes your homepage to “search.ask.com”. “Zwinky Toolbar” is recognized by known antivirus programs as a "Potentially Unwanted Program (PUP)" and may contain and install malicious programs on your computer, like adware, toolbars or viruses. The "Zwinky Toolbar” is distributed by “MindSpark Interactive Network” in order to earn money by redirecting web searches to advertisements from unknown publishers or by displaying annoying pop-aps at your Internet browser. The “Zwinky Toolbar” is commonly bundled inside freeware software which are downloaded -and installed- from known internet sites like “download.com (CNET)”, “Softonic.com”, etc. Please be careful at installation options when you install free software so that you don't accidentally install additional unwanted software or toolbars. Step 1: Uninstall “Zwinky toolbar” from Windows Control Panel. Step 2: Remove Adware & Unwanted Browser Toolbars: AdwCleaner. Step 3: Remove potentially unwanted programs (PUPs). Step 4: Remove “Zwinky toolbar” settings from your Internet Browser. Step 5: Remove Malware programs & Registry Entries: MalwareBytes Antimalware. Step 6: Remove Temporary Internet files and Invalid Registry entries. Step 1. Uninstall unwanted software from your computer. Any other application that belongs to “MindSpark Interactive Network” publisher. Any other application that belongs to “Ask.com” publisher. Step 2: Clean Adware & Unwanted Browser Toolbars. Step 3. Remove potentially unwanted programs (PUPs) with Junkware Removal Tool. Step 4. Ensure that “Zwinky Toolbar” and “Ask.com” homepage & search settings are removed from your Internet Browser. 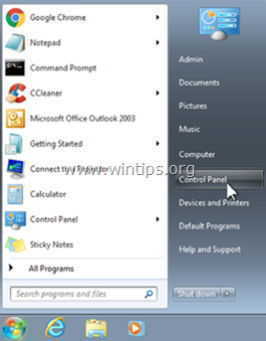 How to remove “Zwinky Toolbar” from Internet Explorer. 4. On "Search Providers" options, choose and "Set as default" a search provider other than the “Ask Web Search” provider. 5. Then choose the “Ask Web Search” provider and click Remove. 6. Choose “Toolbars and Extensions” on the left pane and then select and Disable all toolbars and extensions from “MindSpark Interactive Network” publisher. 7. Close all Internet Explorer windows and restart your browser. 8. Proceed to Step 5. How to remove “Zwinky Toolbar” from Google Chrome. 3. Delete the "home.tb.ask.com" from startup pages by pressing the "X" symbol on the right. 6. Delete the “search.ask.com” entry from “Open this page” box. 7. Then choose the Ask.com search engine “search.tb.ask.com" and remove it by pressing the "X" symbol at the right. 9. In “Extensions” options, remove the “Zwinky” unwanted extension by clicking the recycle icon on the right. 10. Close all Google Chrome windows and proceed to Step 5. How to remove “Zwinky Toolbar” from Mozilla Firefox. 2. In “General” tab, delete the unwanted homepage: “http://home.tb.ask.com” page from “Home Page” box & type your preferred homepage (e.g. http://www.google.com). 4. Choose “Extensions” on the left and then remove the unwanted “Zwinky” extension by pressing the "Remove" button. 5. Choose “Plugins” on the left and set the unwanted “MindSpark Toolbar Platform” plugin to “Never Activate“ (Disable). 7. Proceed to the next Step.